Vogue 1250: I think it’s a go this time! Well, here’s my second go at this very popular dress by Donna Karan. The first one was a disaster due to a bad fabric choice, but this version is wearable. It’s amazing how a particular fabric makes or breaks a design. I used a poly-lycra knit from Emma One Sock that’s been in my stash since last summer. It’s a green-grey feather print on a python print background. Yeah, I know it sounds odd, but it works. It’s a mid-weight knit with substantial body which helps with the skimming and shaping on this dress. I must say I’m very pleasantly surprised with the quality of this jersey. It was a 3H day today with the heat and humidity around 38C, so it was the perfect “test” weather to see just how (un)comfortable this poly-lycra would be. Surprisingly very comfortable without that horrible scratchy itchy suffocating feeling that has been my experience with poly-lycras in the past. Way to go EOS! So here’s what I did differently this time. 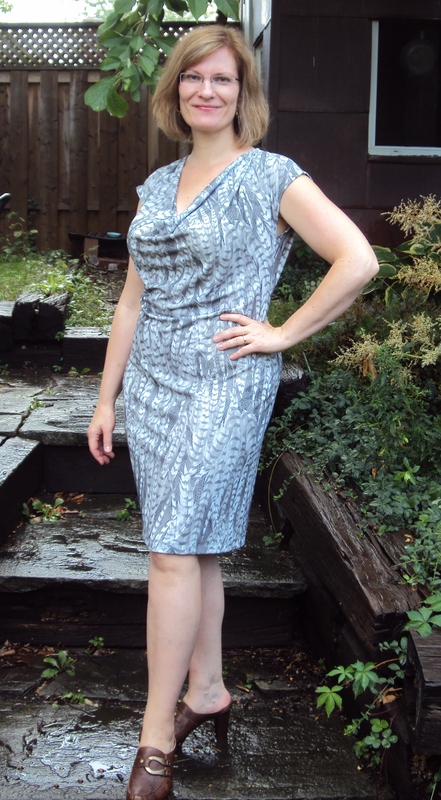 I changed the size from my last run of this dress: I cut my regular size through the bodice (no FBA) and one size smaller through the skirt, and since I’m slightly pear-shaped, that means I cut a straight size. The only adjustments were my usual 1” short waist adjustment; a small addition to the armscye on the back bodice piece to give a more “round” look to the armhole and provide more coverage; and about 3” of additional width to the cowl facing. I will confess to copying Kay’s design changes for the cowl and armscye, which you can read about on her blog. Thank you, Kay! I’m still not so enamoured of this dress that I need a second version. One is definitely enough. It’s passable in this print, but contrary to popular opinion, I don’t like it enough to sew another!